Optomec, a leading global supplier of production-grade additive manufacturing systems for 3D-printed metals and 3D-printed electronics, recently announced that its Aerosol Jet technology is being used by LITE-ON Mobile Mechanical SBG (LITE-ON) for high-volume production of electronic devices. What a neat way for the Albuquerque, NM-based company to show off what it can do. LITE-ON, a global contract manufacturer, has pioneered a 3D Direct Printing (3DP) solution that enables 3D antenna patterns and other functional electronics to be integrated into virtually any mechanical structure or cover -- including complex surfaces -- maximizing design flexibility, ensuring optimal placement and performance, and allowing slimmer product designs. Using the Aerosol Jet technology, LITE-ON's 3DP systems can print sensors, antennas, and other functional electronics onto plastic components and covers, as well as metal die-cast insert-molded polymer frames -- and even onto glass panels and ceramic materials. Feature sizes can be as small as 10 microns. 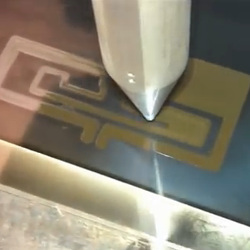 Video: Aerosol Jet technology prints electronic paste on a dimpled golf-ball surface, just to show that it can handle surface complexity. LITE-ON first purchased Aerosol Jet technology to develop prototypes for its OEM customers, which include world-leading communication device, personal care, and automotive brands. The digitally driven Aerosol Jet-based 3DP process provides full design flexibility, with quick iteration and minimum lead time for last-minute changes. 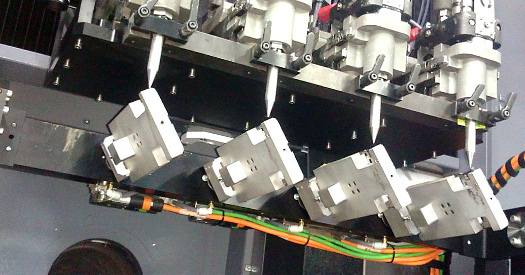 After successfully implementing Aerosol Jet in prototype environments, LITE-ON expanded its usage and has now deployed multiple production machines in Guangzhou, China, where it operates 24/7 printing conformal electronics onto millions of consumer devices. Since the 3DP process requires no plating or special resins, logistics are simplified and production costs are lowered. The open architecture of the Aerosol Jet hardware allows configurations to be optimized for specific production needs. The implementation at LITE-ON leverages a series of Aerosol Jet print modules spread across multiple 5-axis motion platforms, configured to handle common smartphone and tablet form factors. Each machine is able to print a wide range of common electronics materials, at a rate of millions of units per year, enabling next-generation applications in consumer electronics, automotive, aerospace, and smart IoT devices. Optomec's patented Aerosol Jet Systems for printed electronics and LENS 3D Printers for metal components are used by industry to reduce product cost and improve performance. Together, these unique printing solutions work with a broad spectrum of functional materials, ranging from electronic inks to structural metals and even biological matter. Optomec has more than 200 marquee customers around the world, targeting production applications in the electronics, energy, life sciences, and aerospace industries. Aerosol Jet printers support a wide range of commercially available materials, including diluted thick-film pastes, thermosetting polymers such as UV-curable epoxies, and solvent-based polymers like polyurethane and polyimide. A combination of chemistry and post-treatment allows functional electronic structures to be fabricated directly on low-temperature substrates. Conductor inks including Ag, Pt, Pd, and Cu have been developed with cure temperatures less than 120 deg C, and higher-temperature ceramics, ruthenates, and ferrites are cured using proprietary laser treatment. Semiconductor, resistor, dielectric adhesives, and etch-resist formulations also have been deposited with Aerosol Jet printers on a wide variety of substrates, including polyester, polyimide, glass, C-Si, ceramic, FR4, and metal materials. Even biomaterials such as proteins and DNA have been deposited with Aerosol Jet printers without denaturing or loss of bio-activity.